Neoclassicism (late 18th and 19th centuries) was ushered into France during the reign of Louis XVI (1774-1793). 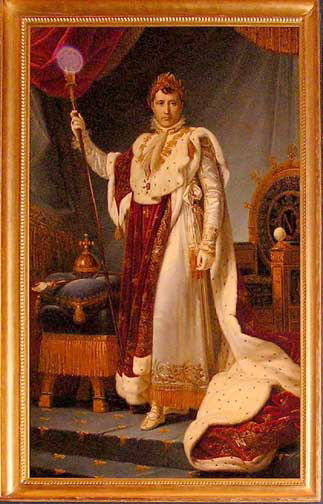 After the French Revolution, during which he was beheaded, politically, the Directoire lasted only four years, from 1795-1799, but the regime's aesthetic ideals, which originated in the Reign of Terror (1793-94) survived until the introduction of the Empire style, which was firmly established by about 1810. Empire style is originally the elaborate Neoclassical style of the Napoleon's French First Empire (1804-1815). Roman-inspired symbols, furniture, and even hairdos were part of an ambitious scheme to relate Napoleon to Emperor Augustus as the French government was transformed from a republic into an empire. There is no distinct Empire style of architecture. The style was largely inspired by Napoleon's architects Percier and Fontaine. It is a period which combines the grandeur and martial symbols of Rome with Ancient Egyptian motifs and the elements of Greek architecture. After the successful campaigns in Egypt, Egyptian motifs. In 1798, Napoleon returned triumphant from his Egyptian campaign. The victory launched a program of intense scientific research, prompted by the large numbers of archaeological discoveries collected in Egypt by the throng of scholars accompanying the expedition. The worlds of fashion and the applied arts also took up the Egyptian theme, with motifs such as sphinxes, winged lions, lotus blossoms, caryatids and scarabs appearing everywhere. All over Europe, Egyptian motifs, as well as those drawn from Ancient Greece and Rome, were to become prominent features of the sumptuous Empire style of decoration. Of some importance in the ferment that was generating an international taste were commercial contacts with England enshrined in treaty since 1786, which encouraged exchanges between collectors, dealers and travelers Interrupted by the war, they were resumed in 1802, following the Peace of Amiens, so that the work of Adam and Sheraton continued to influence French furniture production during the Directoire and the Consulate. Empire style is not to be confused with the Neo-Baroque Second Empire style. 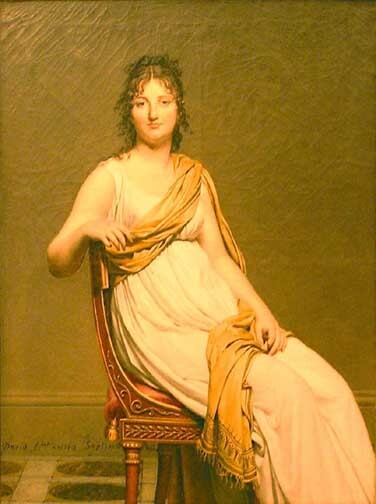 The empress Josephine introduced the high-waisted court dress with train, which shows Greek influence. Men began to wear full-length trousers and polished top hats. Stucco decoration or painted classical motifs often enriched the walls; the ceilings were plain. 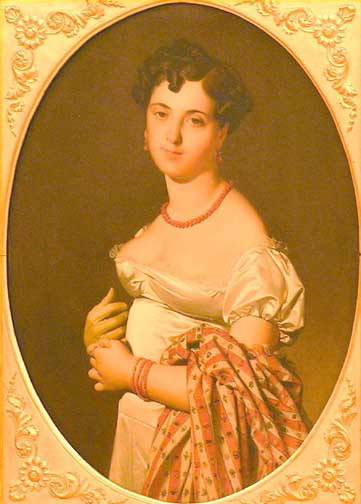 The style continued in fashion until c.1830. 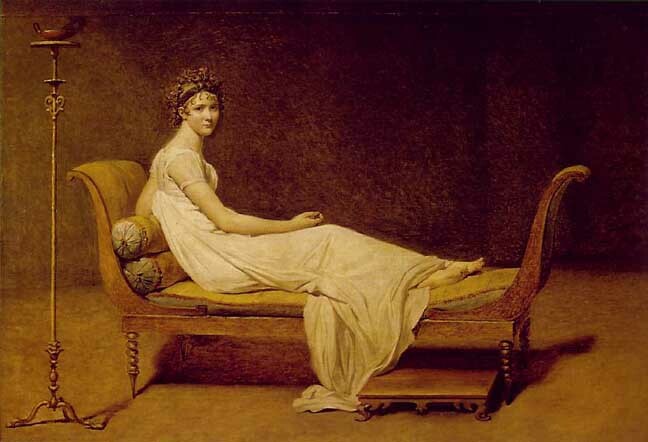 Charles Percier and Pierre Fontaine were the great designers of furniture and interiors of the period, and Jacques Louis David was the major art force of the time. Furniture was characterized by clear-cut silhouettes and symmetry in decoration. The furniture of the period is massive, architectural in concept, and lavishly trimmed in bronze and brass on rosewood, mahogany, and ebony. Gilt stenciling was popular as was the use of ormolu (a type of brass made to imitate gold). 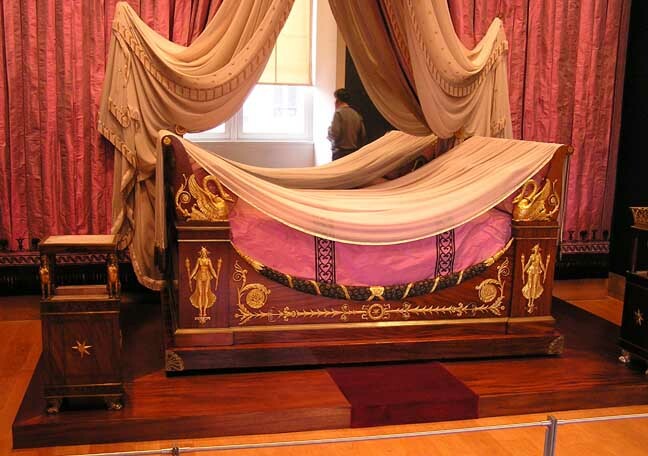 Empire bed - A typical bed of the early 19th century in France, low and usually set against a wall or in an alcove, with only one major side exposed. Curved sweeping ends for the headboard and footboard. The Empire bed is similar to the boat bed and the gondola bed, and was a forerunner of the American sleigh bed. Empire drape - A simple, classic drapery treatment. The fabric is caught at the top hem at equidistant points, and the valleys, formed between these points, fall freely. A formal pattern is created of fairly rigid verticals from the caught points to the floor, alternating with draped billows. Very popular in the early 19th century. Klismos chair - No original Greek klismos chair survived into modern times. Often illustrated on Greek pottery, the design was resurrected in the Empire and other styles. Bold carving in high relief, emphasizing outline instead of detail. Structural scroll components and heavy geometric shapes. Stenciling or gilded brass or bronze decoration. 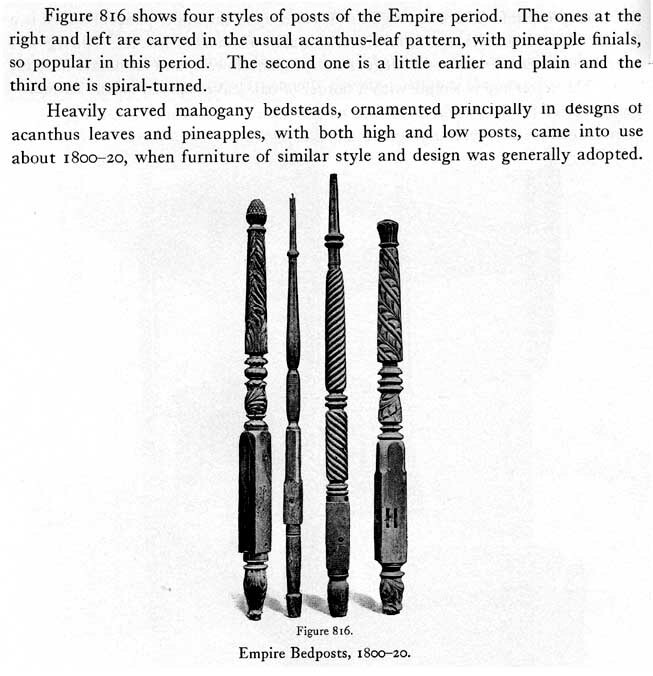 Saber or curule (X-shaped) legs. Feet: large scroll, ball, or carved animal (esp. dolphin or lion). Solid vase-shaped splats on some chairs. Marble tops and heavy pedestal bases on tables. Primary woods Rosewood or mahogany; also handsomely grained maple; pine, birch, or other local woods for country pieces. Secondary wood Beginning in the Empire period, pine became almost standard. Scroll-end sofa and settee. Récamier and méridienne. Ornamental center table, mirrored-back pier table. Federal, Empire and Late Classicism are the American versions of European Neoclassicism. Some books, for example, antique price guides, refer to Empire style furniture as Classical style. Some authors do not distinguish between Empire and Late Classical, regarding Late Classical simply as Empire. 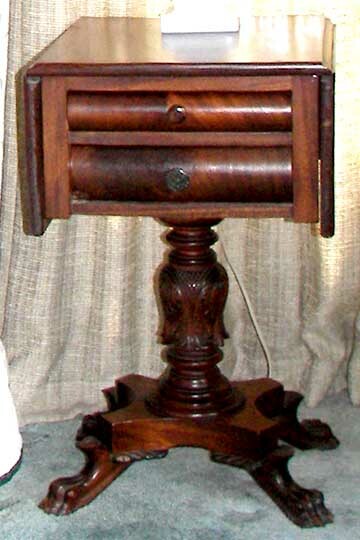 In America, Empire furnishings, with their undulating scrolls balancing heavy geometric shapes, complemented the Greek Revival architecture of the period(1820-1860), the unofficial national style. A French émigré, Charles-Honoré Lannuier, was one of the first cabinetmakers to introduce the style to America. Working in New York between 1803 and 1819, he combined belated Louis XVI and early Empire designs. His gilded caryatids on tables and chairs provided an elegance that had great appeal; other cabinetmakers tempered this stylishness with great restraint. 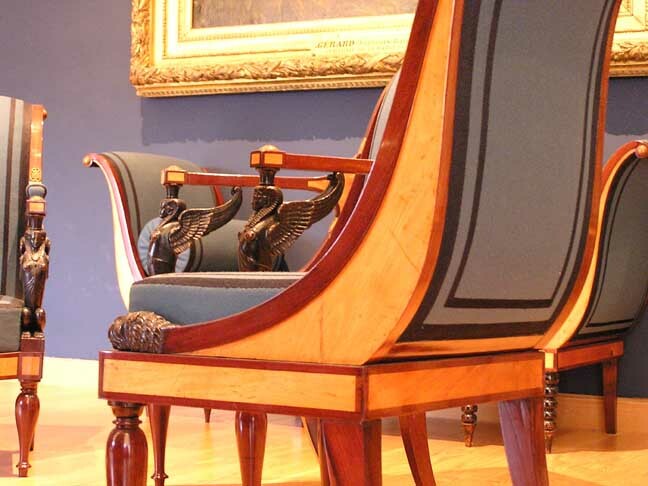 Duncan Phyfe, in the 1820s and 1830s was the most popular Empire furniture manufacturer. While Duncan Phyfe's workshop produced restrained but elegant Empire designs, more flamboyant pieces with lavishly carved details were executed in Philadelphia and Boston. Later American design books from the beginning of the Victorian period, such as those by John Hall of Baltimore (1840) and Robert Conner of New York (1842), still included Empire designs. The Empire style became popular in America around 1815. Developed in Paris at the end of the 18th and beginning of the 19th century, it the official style of the Napoleonic Empire and relied heavily on the revival of antique Roman forms. In this it resembles English Neoclassicism and American Federalism, but unlike these movements, the Empire style was literal in its interpretation of antiquity. The delicacy of the earlier Neoclassicism gave way to heavier classical forms with more emphasis on outline than on carved detail. Inspiration for Empire forms was derived from ancient models illustrated in a number of contemporary French and English publications. Even as late as the 1840s, when Victorian taste had begun to take hold, American design books included a number of Empire models. In the country, the style lasted throughout the 19th century. 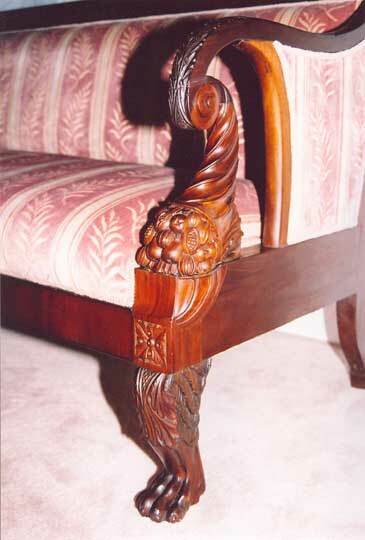 Mahogany continued to be the preferred wood: walnut was substituted when the more costly wood was not available. Veneer was also common, especially in inexpensive pieces. Inlay, which had been so important during the Federal period, was replaced by carving in high relief, stenciling, gilding, and stamped-brass plaques; marble was also common. Other pieces were kept simple by omitting carving and emphasizing overall line. In this period, industrialization began to affect furniture manufacture. The introduction of the circular saw and machinery that could cut thin sheets of veneer allowed manufacturers to increase their output. Because of mass production, Empire furnishings could be made at every price level. By the 1830s the expanding middle-class market had created a nationwide furniture industry that began to replace the craftsman's workshop. There must have been in New York hundreds of rooms with dark blue walls and cold white highly architecturalized mantels and doorways, in which the furniture included a Récamier type of sofa, a very architectural table, and some low-back, rather Greek side chairs, great festooned draperies of satin or silk, with ponderous fringes and gilt architectural cornices. The Clipper ships brought over objects which introduced an alien motif and were cheerfully imposed on the classic base -- China gods and lacquer work, silks and screens mingled cheerfully with the cold austerity of these classicisms. Empire pieces are typically massive and often supported by lyre-shaped legs: feet may be scroll-shaped or carved to resemble animal paws. American Empire - Bedsteads were of the gondola, sleigh, four poster, or "pineapple" (four posts terminated with pineapples designs) type. Tapestries supported by posts were passé. 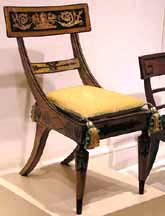 See: Klismos Note, however, that some historians classify Klismos chairs as Federal. Sheraton's Fancy chairs are considered Empire style, even though the front legs are not saber legs. Empire-style secretaries are less varied than their Federal predecessors and almost always incorporate heavy Empire-style pillars and massive feet. Doors are often glazed, and the arrangement of shelves and cupboards is simplified. Caned settees were often painted black, with gold stripes. 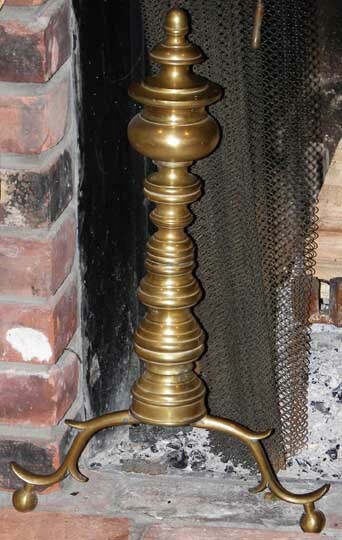 The mahogany at first was polished to a brilliant luster Later it was dyed a deeper, richer red. Sideboards went classically architectural, with scroll or pillar supports, two end doors and two central doors Soon a looking glass was invariably set in the back rail, often with shelves above it. Mahogany was the preferred wood, with symmetrically matched veneers placed on pine; though curly maple and even rosewood were at times used for extra elegance. As woodworking machinery came in, carving disappeared. Drawer pulls were of glass, or brass rings set in lion's mouths. Had drop leaves, or leaves to be inserted, usually with square ends. The support was usually a massive plinth or pedestal in the center, with flaring legs which ended in lion's feet. Some authors distinguish between Empire and Late Classical; some do not.